Here are some questions I’m often asked. Maybe something you’d like to know is here. Q. In The Jacket I Wear in the Snow, is the child a boy or a girl? A. Yes! (Big pause to consider the absurdity of that answer.) When I was writing the story I was thinking about a boy, but never gave that clue in the words. 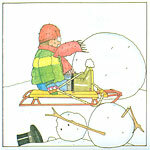 When Nancy Winslow Parker drew the pictures, she was thinking about a girl. Most of the pictures could be either, but most boys don’t wear sweaters with cute little sheep on them. 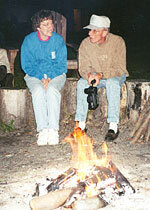 My husband, Eric, and I enjoyed a campfire at a writing retreat. A. My husband Eric has died. We belonged to the same writing group. One time he wrote a funny story about me picking out carpeting for our house. A. We have a daughter who is grown. She has four children. They live on Mackinac Island between Michigan’s Upper and Lower Peninsulas. My laptop allows me to enjoy my backyard while I work. 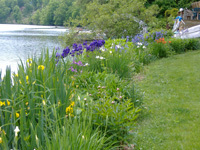 A. I live along the Thornapple River in Grand Rapids, Michigan where I enjoy growing flowers and watching birds. Q. When you were a teacher, what grades did you teach? A. My first teaching job was in a sixth grade class. I’ve also had fifth, fourth, and, for most of my career, third grades. Q. Why did you want to be a writer? A. I enjoy stories and I like playing with words. Q. Is the cat in your picture books your cat? A. No. That’s Clyde, a cat that owned Nancy Winslow Parker, the illustrator. A. Not right now. We’ve had dogs, fish, turtles, and chameleons. It’s easier to take care of stuffed animals. Q. What is the favorite book you’ve read? A. There are many books I really enjoy, but my very most favorite is Charlotte’s Web, by E. B. White. Q. Of your own books, which is your favorite? A. That’s sort of like asking your grandmother who is her favorite grandchild. I love them all. Usually the one I like best, is the one I’m working on at that time, because I haven’t figured it all out yet. Q. What’s the most unusual question you’ve been asked? Q. What is your favorite type of animal? A. Stuffed ones. You don't have to walk them, feed them, or clean up after them. They mind well. A. I like red best. When I go shopping, red shirts and sweaters jump off their hangers to go home with me. Q. What color is your bed? A. My bed is brown wood. It is very old. It belonged to my husband's grandmother. I guess that makes it an antique. I have a white and pink cover on top with green ribbon trim, and a whole lot of pink, white, and green pillows. A. I like to grow flowers, especially iris. Here's a photo of one of my gardents. It was taken in spring. Nothing blooms in the snow. Q. What was your pet fish's name? A. I had two. I called them Fishy One and Fishy Two. I think they were twins since they looked alike, so sometimes I probably got their names mixed up. A. I like to READ, write stories, READ, work in my garden, READ, do Sudoku puzzles, READ, go for walks, READ, and READ. Q. What color is your car? A. My car is red to match my red sweaters, red blouses, red jackets, red hats, red mittens (we need those a lot in Michigan), red coat, red socks, and red boots.